Continuing with Joomla 3.4 Beta release, Joomla 3.4 Beta 3 has come out with some bugs resolved and new features equipped. This Beta version should only be used on test sites. Beta releases cannot be upgraded. 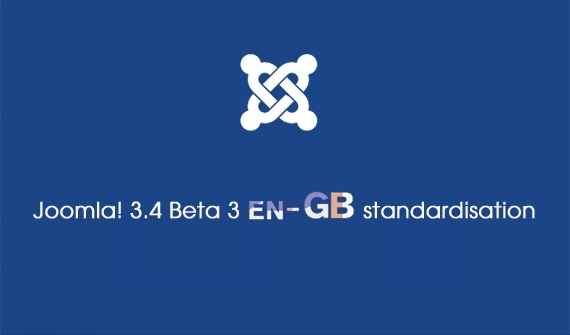 en-GB is the official language of Joomla. This new feature is to standardize all the en-GB language strings in the core of Joomla based on the style guide that you can see here. This will ensure consistency throughout Joomla. It will provide translation teams with an easy framework and guidelines to create their own style guides to ensure consistency throughout the project. With Font en Module editing incorporated, you can edit modules directly on the page without the need to use the admin dashboard. This new feature simplifies the administration of websites by making them incredibly easy to edit! The first step of removing com_weblinks from the core distribution is completed. Weblinks will not be removed from your Joomla installation, maintaining backwards compatibility. It will install like a normal extension. For the 3.4 release, Composer is being integrated into the CMS for managing external dependencies such as the Joomla! Framework and PHPMailer. As Google introduced a new API that radically simplifies the reCAPTCHA experience called "No CAPTCHA reCAPTCHA", Joomla! team also updated this change to Joomla 3.4 to protect your login and registration forms against spam. Our teams are working on Joomla 3.4 Beta versions in order to prepare for upgrading our current Joomla Templates as well as Joomla Extensions to be compatible with this latest Joomla version when the official release is available. We'll share you useful information about these releases as soon as we get the news, so please keep following us to receive the latest news.